Below $100, assuming you have a compatible Samsung phone or you have at least a Windows PC with Open CL 2.0 compatibility (to stitch the photos on the desktop), Ben and I both recommend the Samsung Gear 360 (2016). Be careful to keep it turned off as much as possible, to avoid blurgate. From $100 to $300, my recommendation is Xiaomi Mijia Mi Sphere (around $225). Ben would recommend either Xiaomi Mijia Mi Sphere or Theta SC ($199) or Theta S (around $299). I think the Theta S and SC are very good cameras, but I think Mi Sphere is better for photos (much higher resolution, better edge-to-edge sharpness, better dynamic range). You can use the 360 Camera Comparison tool to see for yourself which one you like better. – Panohero H5B with GoPro Hero 6 or GoPro Hero 5 Black. For stitching software, use KeepEyeOnBall.com (free cloud based stitching) or Panorama Studio 3 Pro. – Pano5+1 Mark II, again with GoPro. Same suggestions for stitching software, although keepeyeonball’s compatibility with Pano5+1 hasn’t been tested. – Xiaomi Mijia Mi Sphere (around $225): The Mi Sphere falls outside this price range but it happens to be better than any all-in-one 360 camera at this price range, in my opinion, therefore it would still be the all-in-one camera that I would recommend. – Ricoh Theta V ($429): Ben recommends the Theta V for this price range. For me, the Theta V would be a fine choice for 360 photos if 360 videos are also important to you (iow, it’s because of the whole package, and not purely on the merits of its 360 photos). – Panono ($2099) for 2D 360 photos. Unbeatable resolution and dynamic range, as long as you have the minimum shooting distance of at least 4 feet. Sample photos here. – Insta360 Pro ($3499) for 3D 360 photos with 8K resolution. Check out my sample 3D 360 photos here. And here is my review. – Kandao Obsidian Go for 3D 360 photos. I haven’t tried this camera but I’ve tried its big brother the Obisidan R. The Obsidian Go is $1000 less than the Insta360 Pro and can shoot photos at the same 8K 3D resolution. How do you like the video? Let me know in the comments and stay tuned for one more collaboration video very soon! 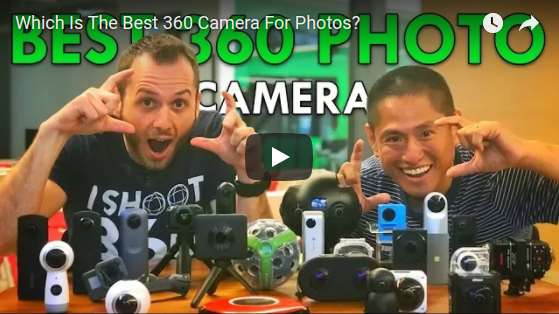 In the meantime, please check out my related post on the best 360 cameras for real estate, and if you haven’t seen it, here’s the other collaboration video I did with Ben, on the GoPro Fusion. If you want me to email you about new articles on 360 Rumors, please subscribe here. Thanks also for the info about the micro pin shutter! I didn’t notice that. I’ll check it out.